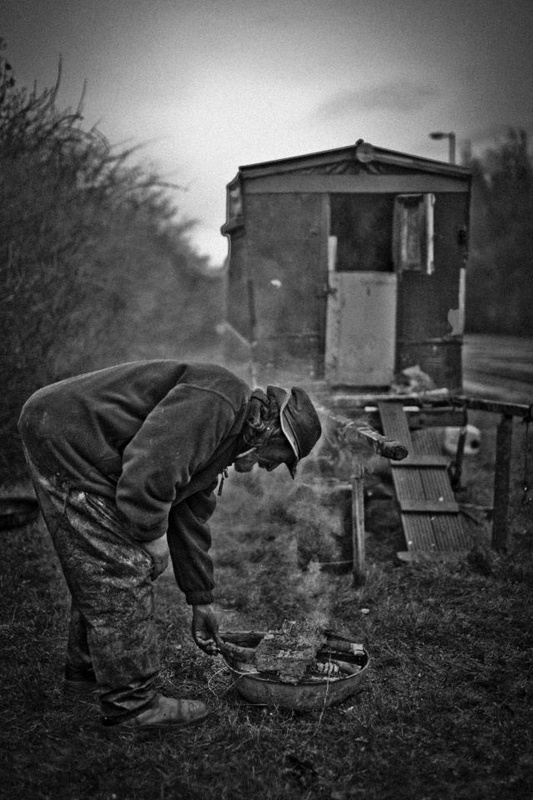 The caravan is the hub around which camp is built, but most “living” actually takes place outside in the wide world. Sometimes this means tents or other temporary structures provide protection from the elements. 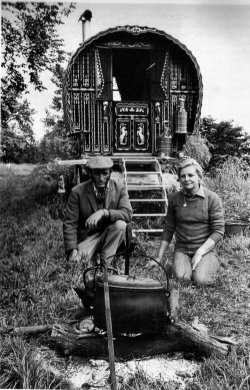 Prior to the second world war, caravan Travellers in Europe often slept outdoors, often under the caravan while the kids were corralled inside. This makes a lot a sense as adults stay up later, and kids can wander off. Cooking is done outdoors, over a fire. The stove, when there is one, is for heat and drying. The hearth is the focus of family life, just as it has been for a million years. That is where people congregate, music and stories happen there, and it is provides comfort and cheer. There is no water closet or toilet inside the caravan. That is disgusting yet one of the most common criticisms I see or receive about mine or other traditional wagons. A consistent anthropological observation about nomads is the strict rules of hygiene and cleanliness. Working and wandering outdoors can be a dirty business so strict rules are adhered to. Some of these reach the level of taboos and can be traced back over at least a thousand years. Living on the road can make one appreciate this need. The fancy wagons of 19th century Britain are the exception, not the rule. Carts and wagons have likely served as the home base for nomads of various types since 500 B.C. or before. They came to their peak of perfection in Britain in the 19th and very early 20th centuries before morphing into the RVs we see today. A Traveller in southwest England. This simple accommodation is much cheaper and more readily built than the fancy production models. A considerate Traveller carries a fire pan to prevent scorching the earth by the roadside. I have seen a similar use for an old steel car wheel many years ago. Unfortunately, most modern versions seem to be too stylised to work. The centre needs to be midway between the flanges, without big holes. A fire is lit in the upper part of the hub, the holes in the wheel allowing the ashes to fall through to the space beneath. Drilling holes through the lower flange will improve the draught. The gentleman I saw using it had cut around the wheel first and removed the turf beneath before lighting his fire, so he could replace it afterwards without the ashes damaging the site. We use old tractor discs nowadays. Some of my friends have even welded short legs on to keep it completely of the ground, leaving no mark on the earth at all. The drum from an electric washer also works well to contain a largish fire, especially in the wind.